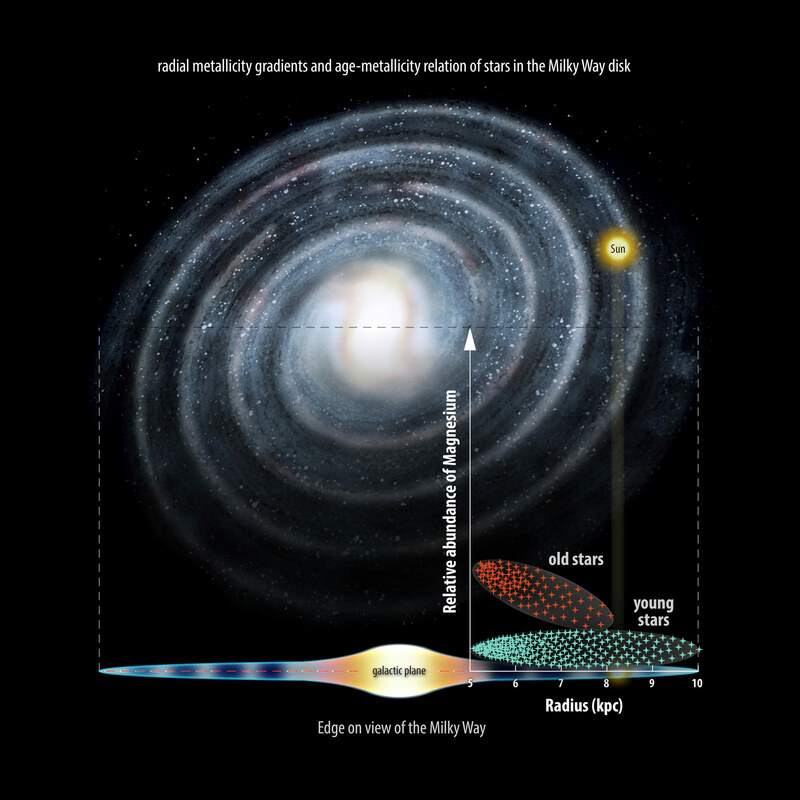 New Gaia-ESO Research Reveals that the Milky Way Formed "Inside-Out"
A breakthrough using data from the Gaia-ESO project has provided evidence backing up theoretically-predicted divisions in the chemical composition of the stars that make up the Milky Way’s disc – the vast collection of giant gas clouds and billions of stars that give our Galaxy its ‘flying saucer’ shape. By tracking fast-produced elements, specifically magnesium in this study, astronomers can determine how rapidly different parts of the Milky Way were formed. The research suggests the inner regions of the Galaxy assembled faster than the outer regions, which took much longer time to form, supporting ideas that our Galaxy grew from the inside-out. Using data from the 8-m VLT in Chile, one of the world’s largest telescopes, an international team of astronomers took detailed observations of stars with a wide range of ages and locations in the Galactic disc to accurately determine their ‘metallicity’: the amount of chemical elements in a star other than hydrogen and helium, the two elements most stars are made from. Immediately after the Big Bang, the Universe consisted almost entirely of hydrogen and helium, with levels of “contaminant metals” growing over time. Consequently, older stars have fewer elements in their make-up – so have lower metallicity. “The different chemical elements of which stars – and we – are made are created at different rates – some in massive stars which live fast and die young, and others in sun-like stars with more sedate multi-billion-year lifetimes,” said Professor Gerry Gilmore, lead investigator on the Gaia-ESO Project. Gaia’s mission: solving the celestial puzzle. A space mission to create the largest, most-accurate, map of the Milky Way in three dimensions will revolutionise our understanding of the galaxy and the universe beyond. Massive stars, which have short lives and die as ‘core-collapse supernovae’, produce huge amounts of magnesium during their explosive death throes. This catastrophic event can form a neutron star or a black hole, and even trigger the formation of new stars. The team have shown that older, ‘metal-poor’ stars inside the Solar Circle – the orbit of our Sun around the centre of the Milky Way, which takes roughly 250 million years to complete – are far more likely to have high levels of magnesium. The higher level of the element inside the Solar Circle suggests this area contained more stars that “lived fast and die young” in the past. The stars that lie in the outer regions of the Galactic disc – outside the Solar Circle – are predominantly younger, both ‘metal-rich’ and ‘metal-poor’, and have surprisingly low magnesium levels compared to their metallicity. This discovery signifies important differences in stellar evolution across the Milky Way disc, with very efficient and short star formation times occurring inside the Solar Circle; whereas, outside the Sun’s orbit, star formation took much longer. “We have been able to shed new light on the timescale of chemical enrichment across the Milky Way disc, showing that outer regions of the disc take a much longer time to form,” said Maria Bergemann from Cambridge’s Institute of Astronomy, who led the study. The findings offer new insights into the assembly history of our Galaxy, and are the part of the first wave of new observations from the Gaia-ESO survey, the ground-based extension to the Gaia space mission – launched by the European Space Agency at the end of last year – and the first large-scale survey conducted on one the world’s largest telescopes: the 8-m VLT in Paranal, Chile. The new research also sheds further light on another much debated “double structure” in the Milky Way’s disc – the so-called ‘thin’ and ‘thick’ discs. Stars in the young, ‘thin’ disc aged between 0 – 8 billion years all have a similar degree of metallicity, regardless of age in that range, with many of them considered ‘metal-rich’. There is a “steep decline” in metallicity for stars aged over 9 billion years, typical of the ‘thick’ disc, with no detectable ‘metal-rich’ stars found at all over this age. In theory, say astronomers, the thick disc – first proposed by Gilmore 30 years ago – could have emerged in a variety of ways, from massive gravitational instabilities to consuming satellite galaxies in its formative years. “The Milky Way has cannibalized many small galaxies during its formation. Now, with the Gaia-ESO Survey, we can study the detailed tracers of these events, essentially dissecting the belly of the beast,” said Greg Ruchti, a researcher at Lund Observatory in Sweden, who co-leads the project. With upcoming releases from Gaia-ESO, an even better handle on the age-metallicity relation and the structure of the Galactic disc is expected, say the team. In a couple of years, these data will be complemented by positions and kinematics provided by the Gaia satellite and together will revolutionize the field of Galactic astronomy. 4 Comments on "New Gaia-ESO Research Reveals that the Milky Way Formed “Inside-Out”"
I am hearing impaired and was disappointed when I could not follow the captions in SciTechDaily’s YouTube video, “Gaia’s Mission – Solving the Celestial Puzzle,” dated 1/20/2014, due to numerous errors in the captioned text. I respectfully request that you or the video’s creator use YouTube’s in-line editor to make the needed corrections. YouTube’s software will allow one to quickly and easily make changes to both the text and time codes of the captions. For more information, please visit https://support.google.com/youtube/answer/2734705.I believe SciTechDaily is one of the best news sources covering the latest scientific developments, and that improved captions will enhance viewing enjoyment for not just hearing impaired readers, but also for students in science, foreign-born individuals learning English, and many others. Thank you, Lita Arnold, M.S. Biology/Environmental Health. Thanks for the response Lita. The video was posted to YouTube by Cambridge University, hopefully they will make the updates soon. Professor Hawking know that there was a time when the universe slowed down while it is expected to accelerate, then accelerated again. Previously, you shared a link about discovering gravity attraction center. Galaxies traveled far away from this gravity center having gravity minimized, which was reflected as a slow down in their activities and growth. I understand that there is compelling evidence suggesting that the Milky Way underwent a major proto-disk-disrupting event about eight to ten billion years ago. Perhaps this pair of disk-like stellar structures reflect stars formed before (Thick) and after (Thin) that event ? Early on, proto-disk gas was metal poor, overall, perhaps dominated by a rapid burst of star formation triggered by the disruption event, and rather puffy and vertically thick ? Later on, mature-disk gas was metal rich, overall, and comparatively thin ?